Before having children my household chores were minimal and easily accomplished. 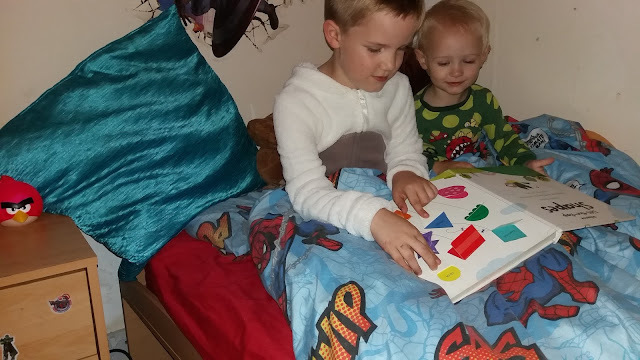 I did not have little monsters darlings destroying a room the moment I turn my back after cleaning and tidying it. My home was not overrun with toys. I did not have little feet and hands leaving messy prints throughout the house. My laundry pile was not a never ending mountain and my laundry basket was often EMPTY! I did not have hungry kids to feed and water creating an abundance of used dishes and a dirty oven. 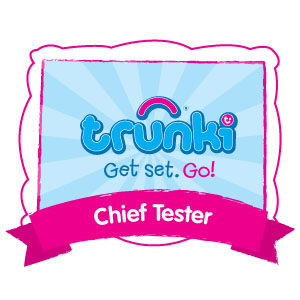 But fast forward a few years and 2 kids my days and household chores have changed. Now keeping the home at a respectable level of tidiness is a constant battle and my list of household chores is never ending. Whilst the household chores seem endless and are tiring I would not change them for the world. Having a busy, full house fills me with joy. Surprisingly one of our family household chores is something I quite enjoy - laundry. Whilst I never seem to see the bottom of our laundry basket anymore and laundry is an endless job of pre-treating stains, washing clothes and bedding, drying laundry, ironing and folding clothes to put away in wardrobes and drawers there is something about doing my family’s laundry that I love. 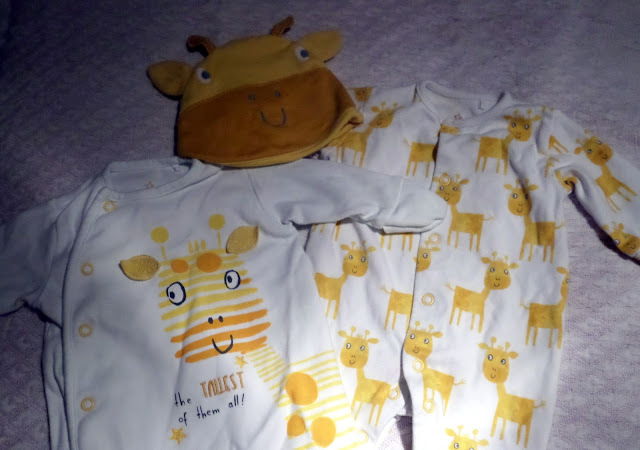 When the boys were babies I found pleasure in caring for their little baby clothes and cloth nappies. 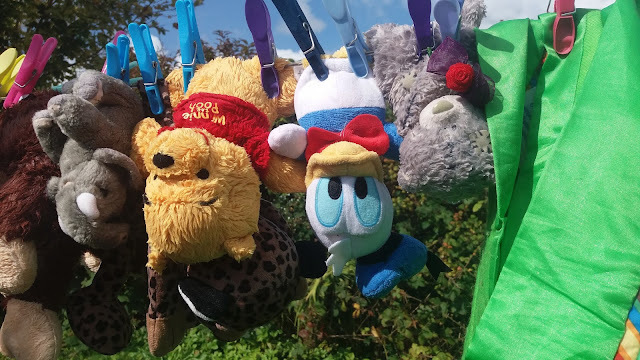 It brought joy to my heart to hang their delicate clothes outside to dry and then lovingly store them in their nursery. 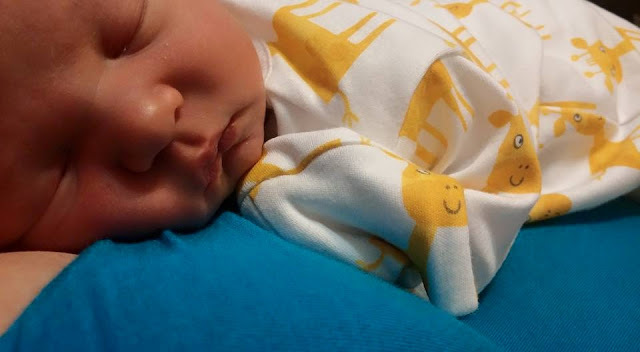 When I was pregnant for the first time doing baby laundry as I nested made the notion of being a mum and having my own child feel real. As they have grown older tending to their dirty laundry has remained something I still find oddly relaxing and rewarding. 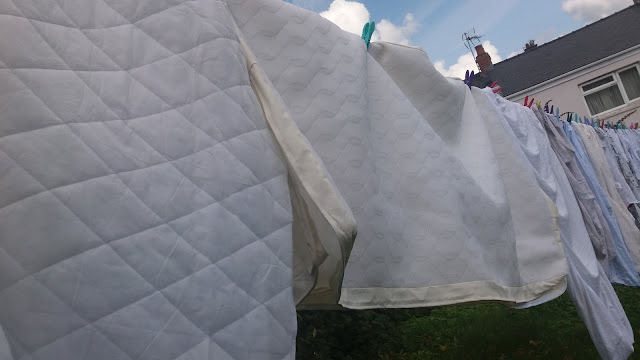 Whilst it is not the most exciting task in the world when I tackle the mounds of laundry I feel productive and thanks to my washing machine and the wind, airers or tumble drier it is on the whole minimal work compared to other chores. 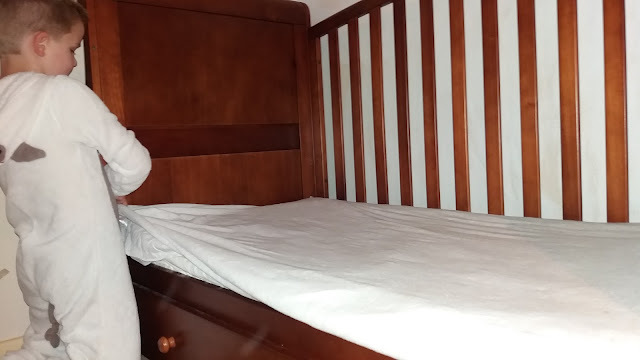 Dealing with the laundry then seeing clean clothes hanging in the wardrobes and folded neatly in drawers along with fresh bedding on our beds fills me with a sense of accomplishment. 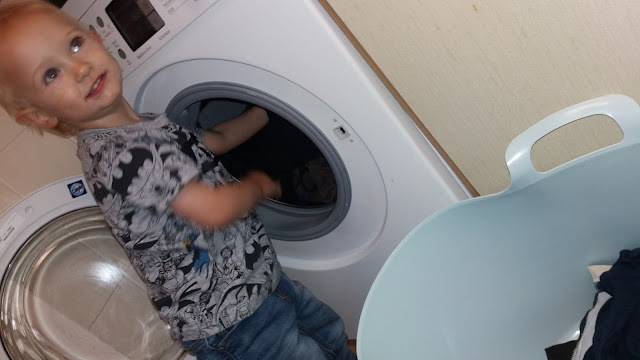 The best of doing laundry now that I am a mum is that I get to do it with a little help from my boys who love to help load the machine, hang the clothes out to dry, put clothes away and even make the beds! 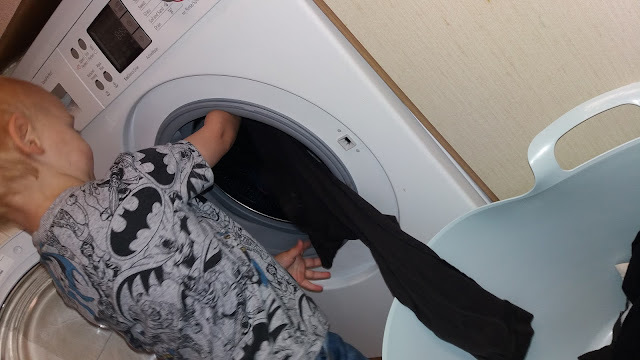 Typically we have numerous loads of washing a week, with the washing machine being put through its paces nearly every day - sometimes more than once a day if we have been on an outdoor adventure or have been swimming. 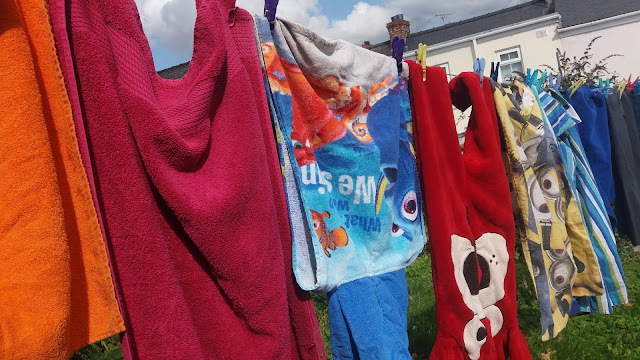 Like most households our laundry consists of mounds of towels, a household worth of bedding, school uniforms, swimming costumes, sports kits and everyday clothing for all 4 of us. One of the challenges of managing our laundry is that we have a wide variety of laundry of different colours and fabric materials which affects how we can wash and dry them. Thankfully over the years I have found I instinctively sort clothes by colour and remember what clothes can or cannot go in particular wash cycles or in the tumble drier without any issue - ‘touch wood’ no pink shirts or shrunken clothing here so far - and always ensure to read the care labels on new clothes before washing. An unfortunate problem with tackling a never ending laundry pile is that the weather can cause issues with drying clean laundry. Whilst we have a tumble drier I try not to use it when possible for economical reasons. Whenever possible I like to dry laundry outside on the washing line and love seeing laundry swaying on the line thanks to the wind. If the weather stops outdoor drying we either use clothes airers or the tumble drier. 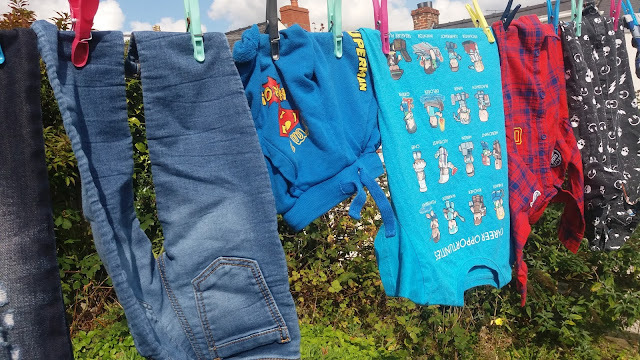 Thanks to living in west Wales where the weather is variable and often rainy drying clothes outdoors is often impossible so I have been dabbling with the idea of trying a heated clothes airer as another option of how to dry our laundry. Until recently a big downfall in dealing with the laundry was our washing machine. 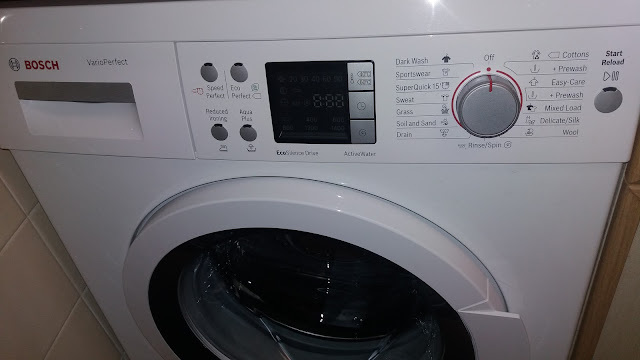 Whilst being reliable and sound for over 10 years before going bang, before it went to washing machine heaven it had started to be temperamental. 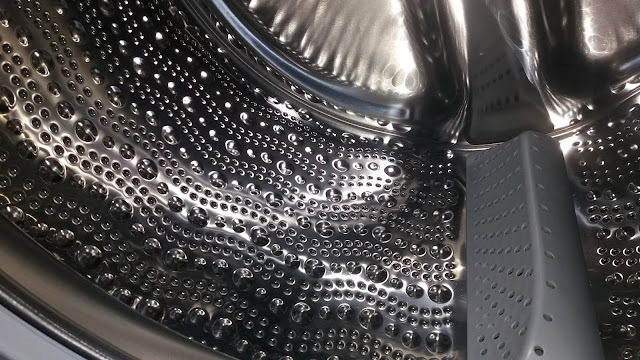 In the past year or so some cycles refused to work and clothes did not seem to come out of the machine as clean and stain free as they once had after 1 cycle. 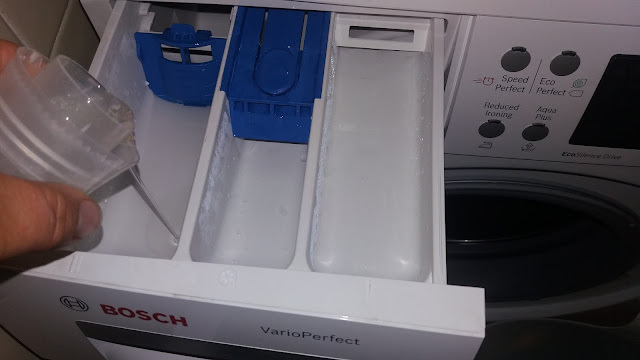 Thankfully our new washing machine which boasts VarioPerfect to ensure top wash results for all types of fabrics and loads, a wide range of helpful cycles such as soil and sand, sportswear and mixed load and an unique WaveDrum our clothes are perfectly washed every time. 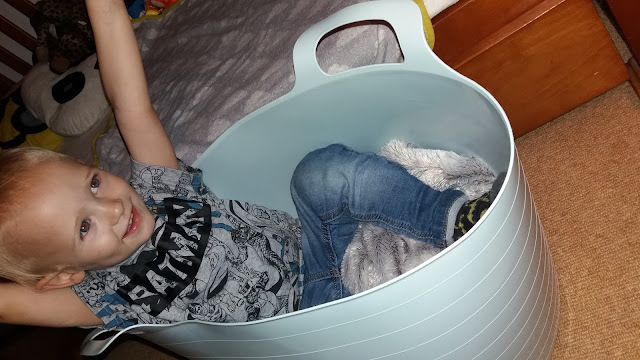 With 2 boisterous boys who seem to attract dirt, mess and muck our laundry basket is being constantly filled. 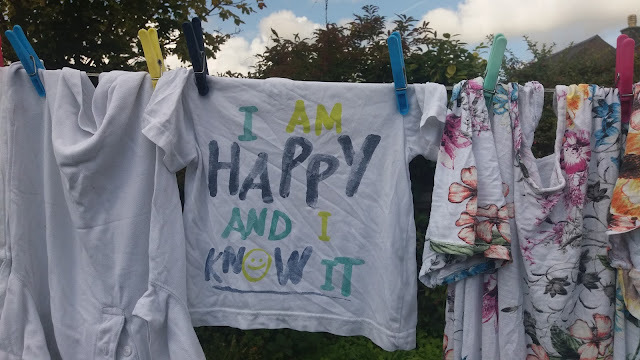 As I don’t mind doing the laundry and believe that life should be embrace and lived to its fullest I encourage the kids to get stuck in and have fun experiences and adventures. Muddy clothes after a woodland adventure shows they had fun running, climbing and exploring. Paint covered clothes after arts and crafts showcases their creative side. Sandy clothes is evidence of a fun filled day at the beach. Clothes covered in powder paint after an UV colourfest party showcases an unforgettable night. 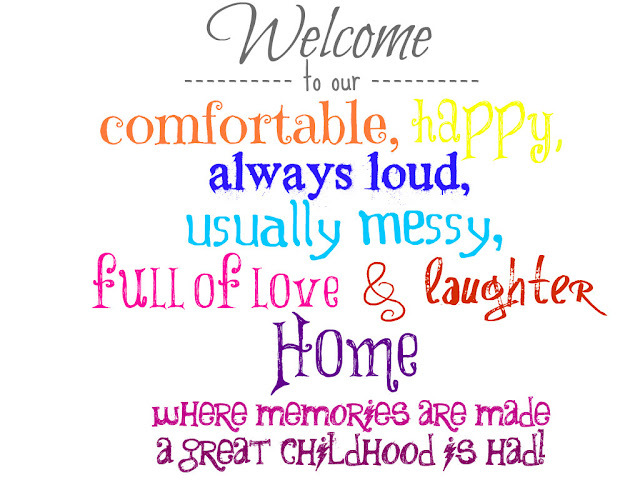 To me the mess doesn’t matter, we are making memories and there is always baths and washing machines to get us and our clothes clean again. 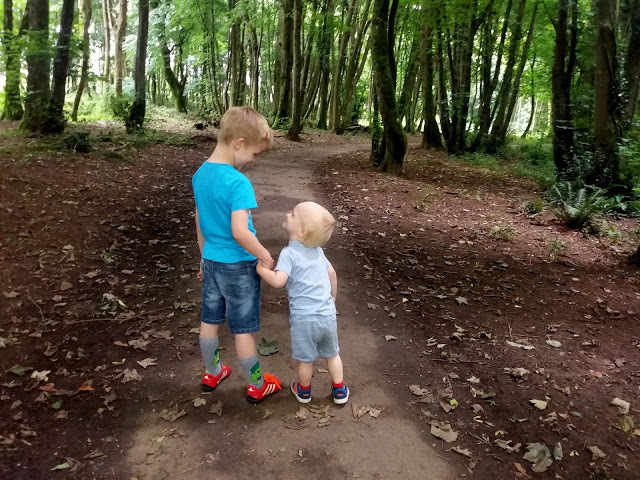 As mud, paint, sand, soil, grass, sweat, sunscreen residue, food and even UV powder paint are common sights on the boys’ clothes I am a big believer in pre-treating stains. Along with using stain remover I also rely on a laundry detergent that is tough on stains and has powerful cleaning prowess. 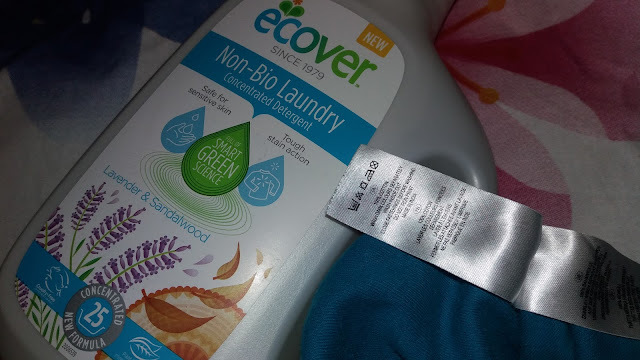 Whilst I look for laundry detergent that has powerful cleaning qualities to help us tackle the whole family’s dirty laundry another must-have quality I demand of my laundry detergent is that it is kind to my family’s skin and clothes. 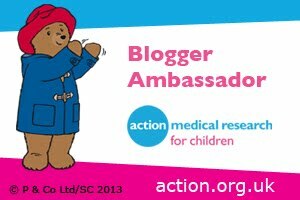 Both the boys have sensitive skin and as a sufferer of dermatographia (aka skin writing) laundry detergent that is gentle on skin is a must. Another big bonus is a long lasting scent. Finding a laundry detergent that combines being kind to skin and clothes, long lasting lovely scent and powerful cleaning is difficult. As such I have to have numerous laundry products for different family members and laundry. 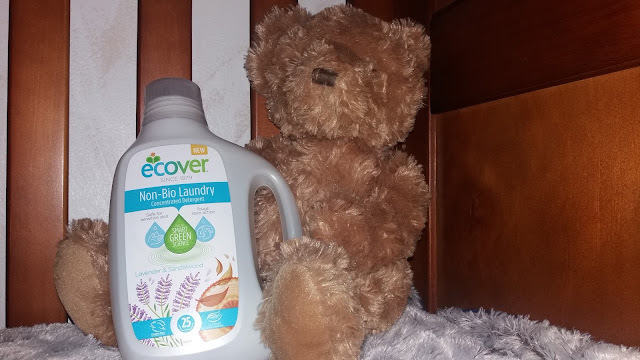 Helping to make dealing with the laundry even easier I have tried a wonderful laundry detergent that works wonders for the whole family - Ecover’s new Non-Bio Concentrated Laundry Detergent. From opening the bottle for the first time I was awash with the beautiful scent of the lavender and sandalwood. The scent is lovely and strong without being overpowering. I love the natural scent which is a lovely change to synthetic, overwhelming perfume scents often common with laundry detergent. Whilst the clothes are being washed in the machine the scent fills my kitchen which is a pleasant bonus. Much to my delight the scent is long lasting and our clothes are left smelling beautiful. I personally adore the lavender and sandalwood scent. 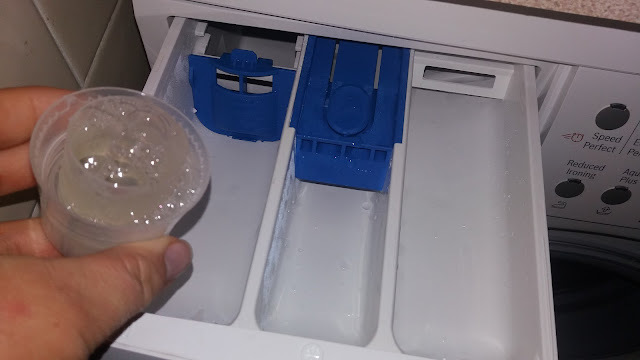 What I was particularly surprised by was the fact that the liquid is clear and fluid like water. 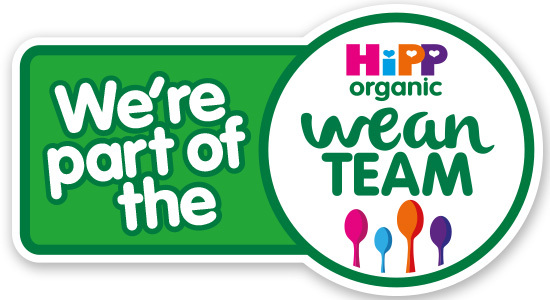 Thanks to the the bubbly liquid’s consistency and colour which is a welcome relief to thicker and/or coloured liquid detergent I feel confident that it is made with plant based and mineral ingredients. I also appreciate and love the fact that it provides tough stain action. It has managed to tackle a number of stains that my boys have thrown at it over the past few weeks - grass, food, paint, mud - it has conquered them all! Much to my delight as well as providing powerful cleaning power and a lovely scent it is also very kind on our skin and clothes. 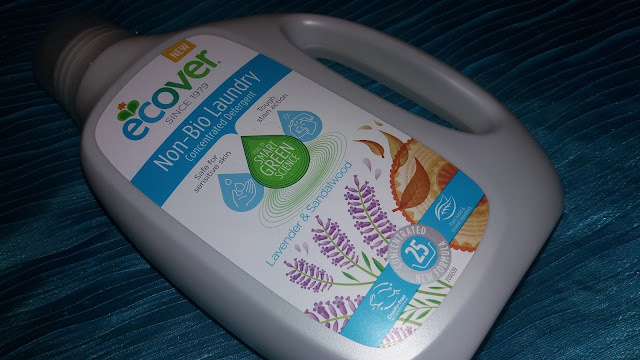 Having experienced reactions to other liquid detergents I was relieved that this did not cause any issues especially as I love the scent so much! 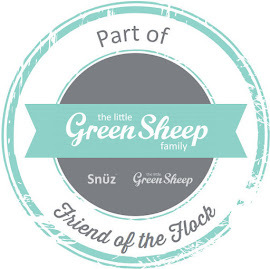 Being a fan of eco-friendly products I also love that it is full of smart green science and is cruelty free. After very positive use over the past few weeks it is now my go-to laundry detergent that we will be solely using again and again. I have highly recommend it to family and friends and only wish I had experienced it before now. 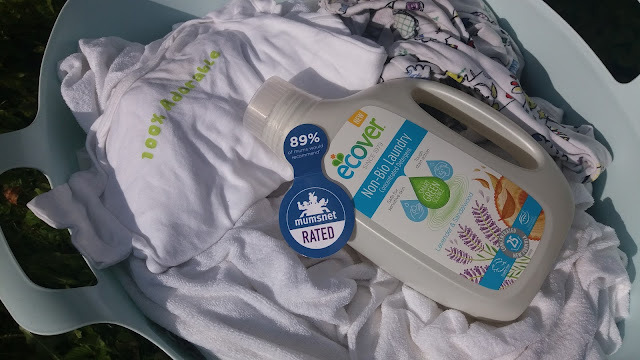 The new Ecover Non-Bio Concentrated Laundry detergent provides amazingly clean clothes, being brilliant for whites, colours, delicates, towels, bedding and even beloved soft toys that need a bit of TLC. Now I take even more pride in my laundry. 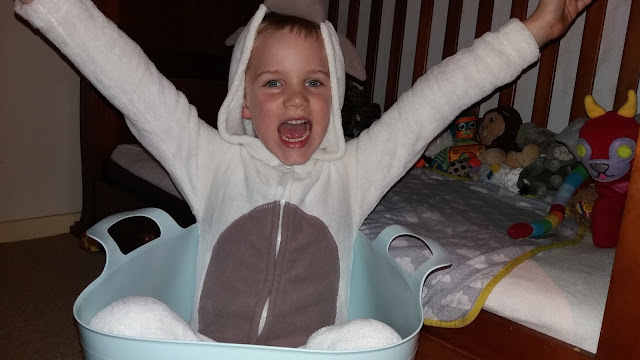 I love dressing my boys in beautifully clean and wonderfully scented clothes and tucking them into bed of a night in soft, clean bedding that has a wonderful, relaxing aroma of lavender and sandalwood. 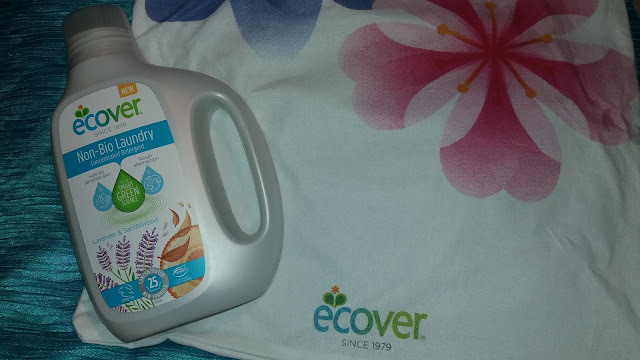 I never knew cover did washing liquid so I'll have to try it as I love the brand!